about 88 MT during the terminal year of 12th Plan (2016-17). This was stated in a press release issued on Tuesday. The coal major has taken up a slew of other initiatives to increase coal production. 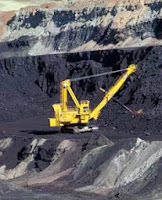 Following the announcement in the Union Budget, 2013 regarding public private partnership (PPP) policy framework with Coal India as one of the partners, MDO mode of operation for enhancement of production capacities of coal mines of CIL has been initiated in seven projects of CIL. Modernisation of coal production has become necessary given the fact that around 66 percent of India's power generation is coal-based and India is the third largest coal producer in the world. In order to absorb world class technology and modernise its operations, the PSU has decided to appoint a consultant of international repute for the modernisation of its mines. The bid for selection of consultant is under process. In order to overcome the problem of slow coal evacuation from its three major coalfields namely North Karanpura – Auranga of CCL, Mand Raigarh – Korba of SECL and Ib Valley of MCL which have a high growth potential, CIL has planned investment of Rs 7045 crore in three major railway infrastructure facilities namely Tori-Shivpur (Kathotia), Mand-Raigarh-Korba and Gopalpur-Manoharpur in these coalfields, respectively which is under various stages of implementation. These rail links together will stretch to about 435 km, are expected to handle 150 MT by the end of 12th Plan periods. The CIL is also planning introduction of high capacity equipment at par with global standards in open cast mines such as Gevra, Dipka, Lakhanpur etc. and introduction of mass production technology equipments like continuous miners and powered support long-wall faces in underground mines. With a modest production of 79 MT at the year of its inception (1975), CIL today is the single largest coal producer in the world. The Maharatna company today produces around 81 percent of India’s total coal production and commands nearly 74 percent of Indian coal market and it feeds 82 of 86 thermal power plants in India. Operating through 81 mining areas, CIL has seven wholly-owned coal producing subsidiaries and one mine planning and consultancy company spread over eight states of India. CIL also fully owns a mining company in Mozambique named 'Coal India Africana Limitada'.